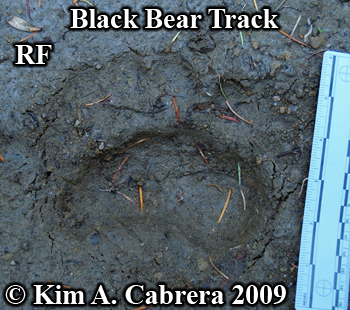 This left front black bear track shows perfect details. All toes and claw marks are visible in this beauty! This perfect track is a rare find. Most tracks are not this clear. 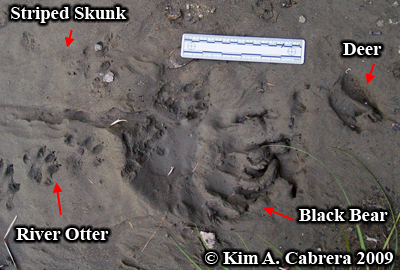 This super awesome black bear track was sunk deeply into the mud. 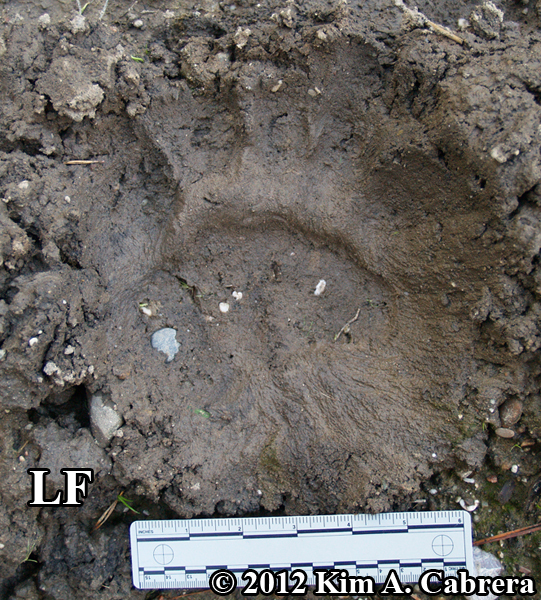 This allowed the fur around the foot to leave an imprint in the mud. This is a perfect left front footprint! 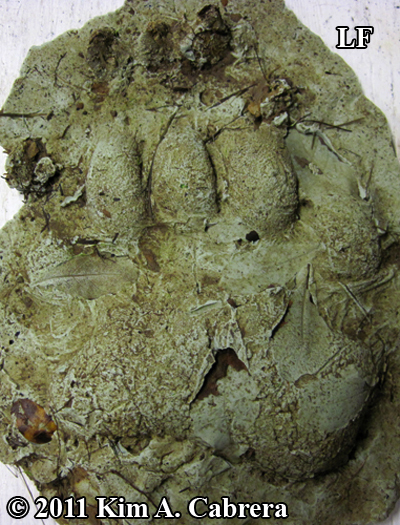 Although the pawprint is in deep mud, the claws did not leave an imprint! This beautiful right front track shows all the details. 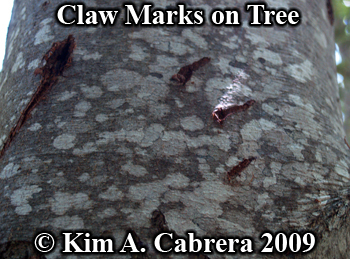 Two claws have left an imprint, but the others are not seen. 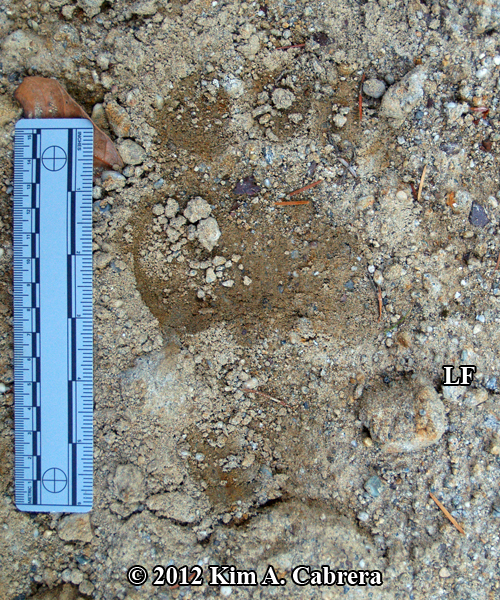 The inner toe on a bear track is the smallest, which is the opposite of human feet. There is also an additional pad called the carpal pad, seen as a circular imprint below the palm of this track. 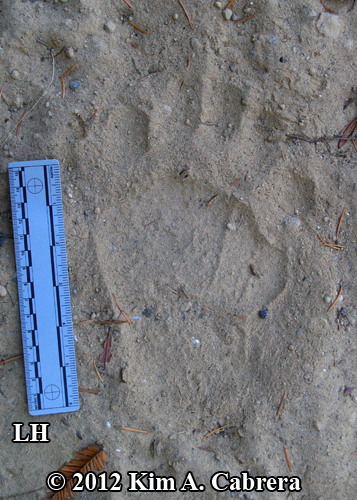 The carpal pad is not often seen in bear prints, unless you have good substrate, like snow or wet sand. 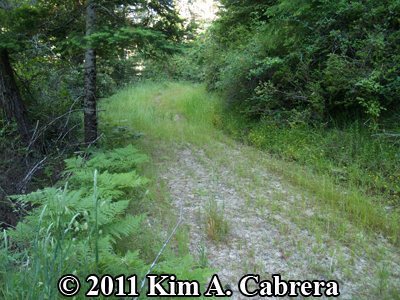 Black bear habitat - the dirt road on which the tracks above were found. A den was found nearby at a later date. See the dens page for photos inside the den. 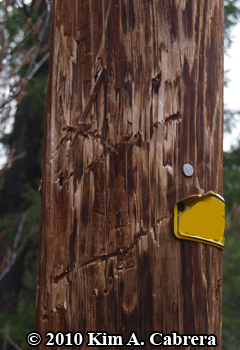 A black bear bit and clawed this power pole and left these marks. 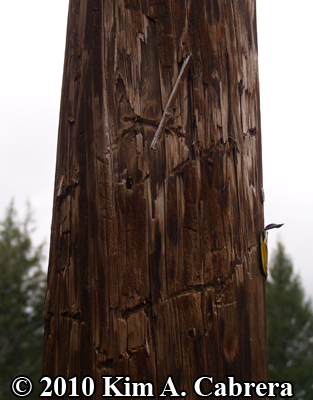 Another view of a power pole damaged by a black bear. 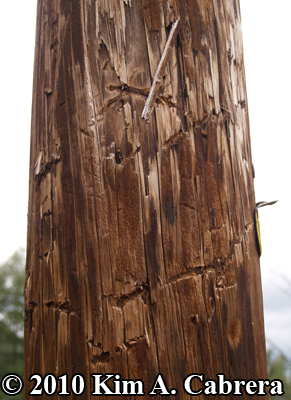 The other side of the same power pole. 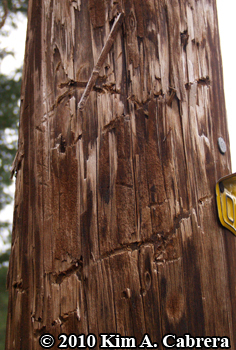 Bears bite and claw power poles, trees, and limbs of trees in this manner. 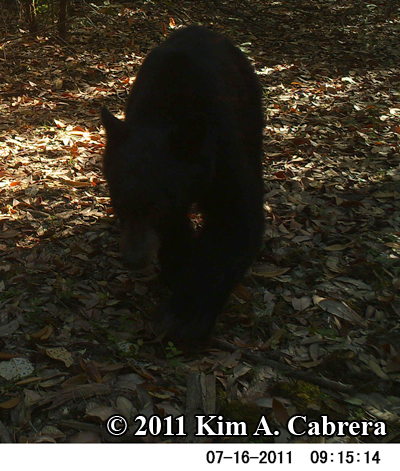 A photo of a black bear yearling cub caught on a trail camera. 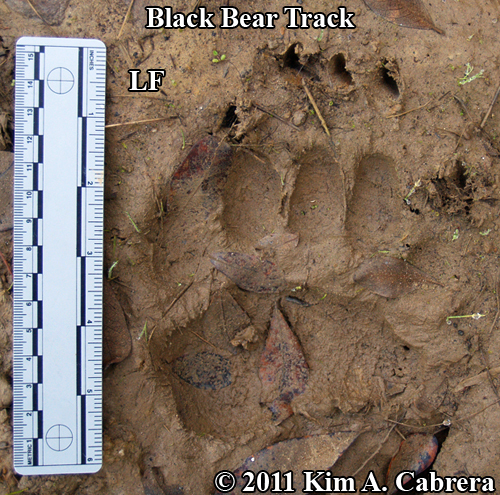 A beautiful right front black bear track in mud. 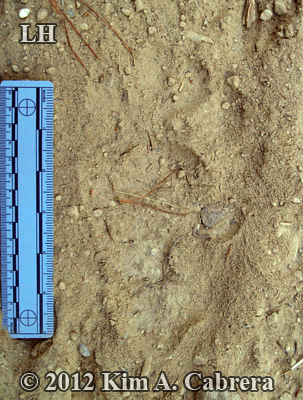 This track shows all the details, including all five toes. The claws do not always leave marks in the tracks. This was a bear track I found on the river bank. The bear had waded across the river, which was fairly shallow, then come out on the sandy bank. It was dripping wet as it walked up the bank, leaving this nicely distorted track in the process. If you look closely, you can see that a deer has stepped in the middle of the track. This track lasted through an entire summer, aging slowly because it was made in mud. The track above was made by the same bear and a river otter walked across this one. 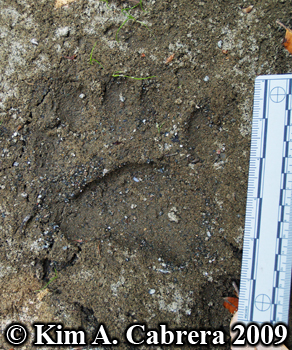 There is also a deer track, as well as skunk tracks. 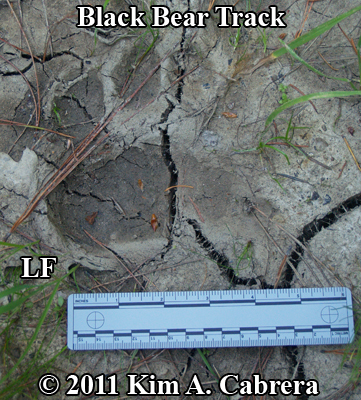 A Florida black bear track pair. This photo shows the hind print superimposed on the front track. 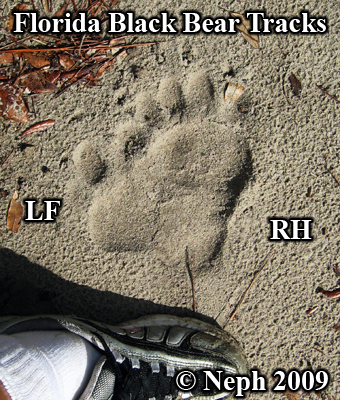 The right hind footprint of a Florida black bear in sand. Donated photos. Thanks to Neph. 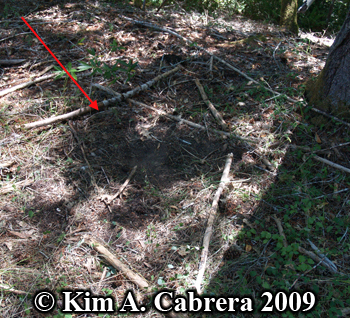 This bear bed was found under a large Douglas fir tree. Nearby, there was a pair of older apple trees that had been abandoned. The bear had been feasting on the apples. Behind this, there was a slope down to a creek, where the bear could get water. All in all, a very nice arrangement for a bear! 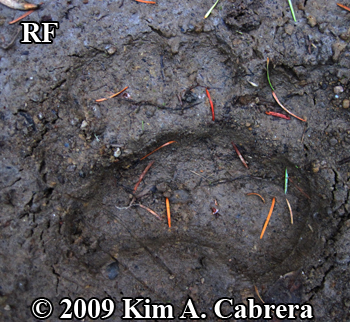 Beautiful right front bear track in mud. This bear was living in a zoo and appeared very bored. :( I would be too! 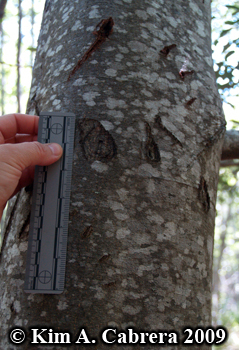 Several alder trees in the vicinity of a state park campground showed signs of having been climbed by bears. 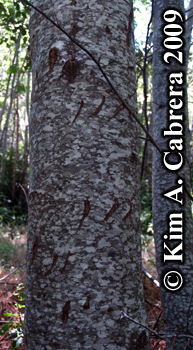 This alder tree bears the scars of several climbs. This scar shows only four of the claw marks. All five toes do not always leave sign. 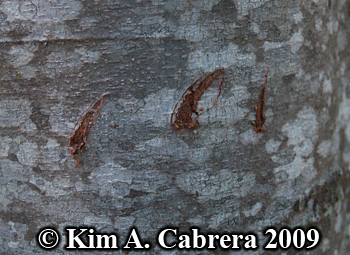 Close-up showing the claw marks on the bark. 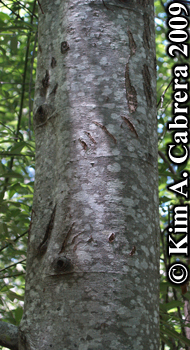 A very nice set of claw marks on another alder tree. 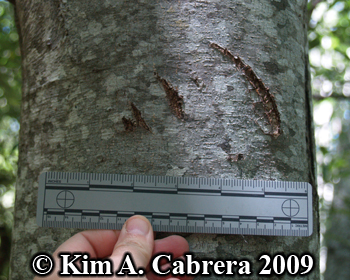 Several sets of scars on the bark indicate this tree has been climbed by bears. 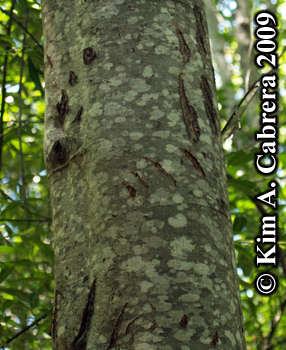 These scars were easily visible from the trail. This is the left front foot. 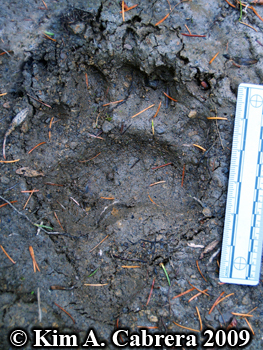 Prints in mud are some of the best bear tracks you will find. 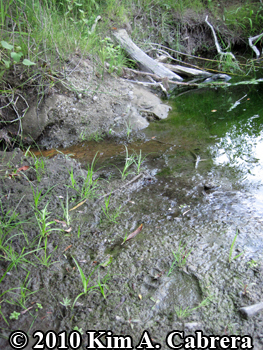 A right front track found in firm, damp sand along a streambed. Another nice right front track found along the same stream. 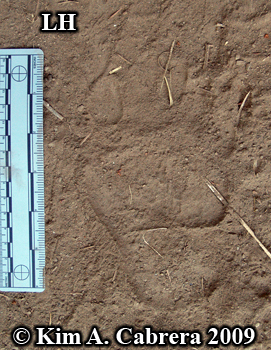 This right hind track was made in firm soil that was overlaid by a layer of fine, dusty soil. A left front and left hind track. The red arrow indicates the direction of travel. 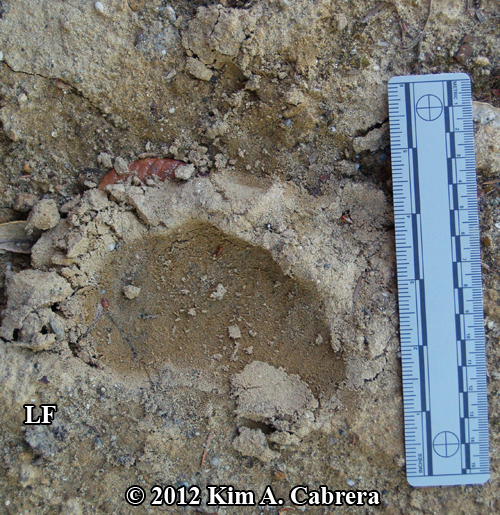 Another beautiful left hind bear track. Notice that the heel pad has a line in it. The pad is one pad, but there is an area in the middle where there is fur. Wet sand provided a nice medium for this left front track. 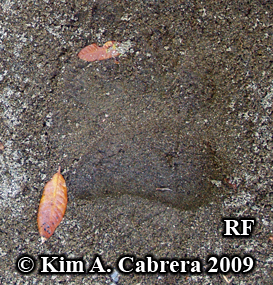 A right front bear track in wet sand. 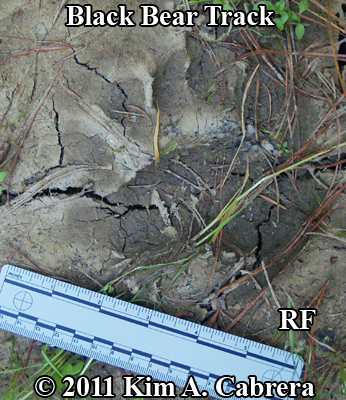 The metacarpal pad (or equivalent to your palm) on this bear's front track is nicely outlined in this damp sandy soil. Although the metacarpal pad is easy to see, the toes left hardly any impression. 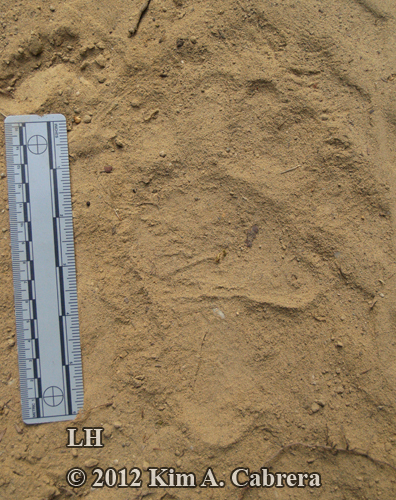 This perfect bear track shows the small carpal pad impression, located behind the metacarpal pad. 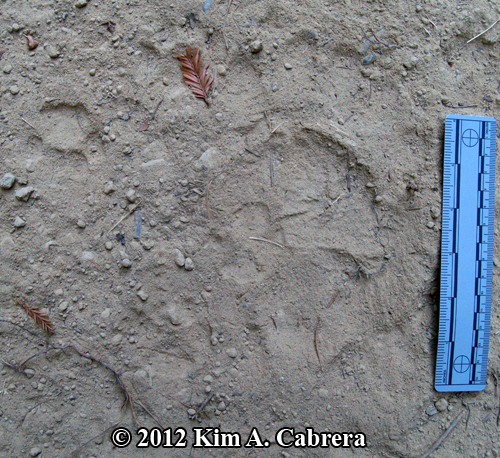 The carpal pad does not show up too often in bear tracks. This is only on the front feet. The hind feet have a different structure. 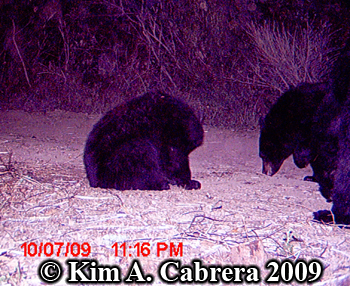 A mother bear and her two nearly-grown cubs were caught on my trail camera. The mother bear is closest to the camera. The two cubs are side-by-side in the background. 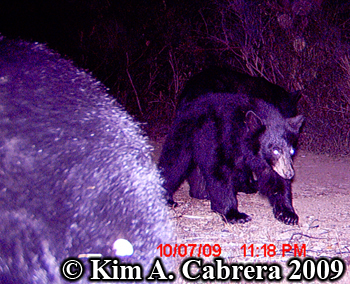 Mama bear looked right into the camera and the flash went off! One of the cubs sniffing at something on the ground. This bear took a photo of itself, but didn't stop to pose properly. The leg is all that's visible. 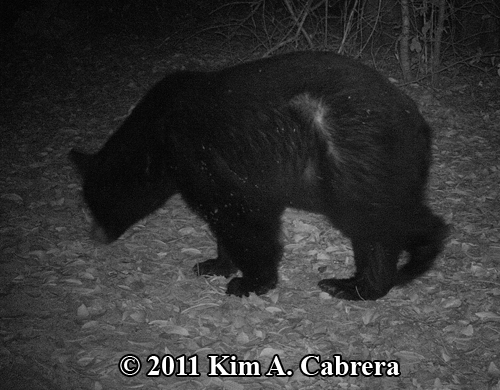 Another curious bear who had the flash go off in its face when checking out the trail camera! 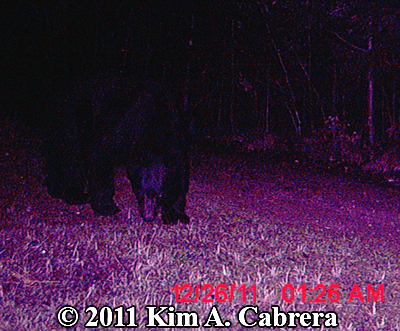 This is the bear from the above photo who looked right at the trail camera just as the flash went off. 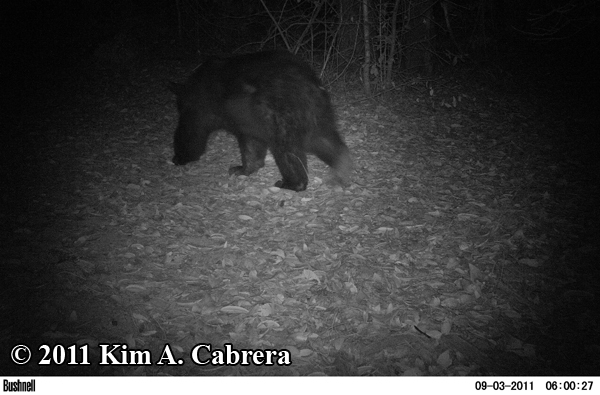 This black bear was out of its den and wandering around in December. 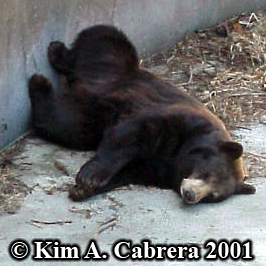 Normally, it is too cold and rainy and the bears prefer to sleep, but this was a dry winter and the bears were active! 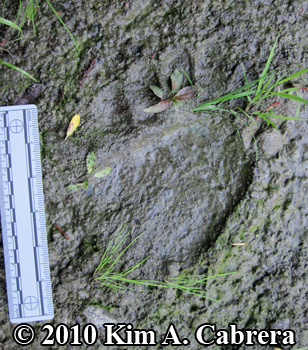 A black bear track in mud next to the Eel River. The mud was very soft, but this print was the best one left. 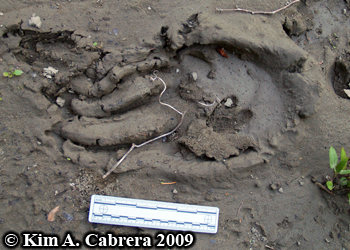 Bear track in mud along the river's edge. The bear walked up onto the little sloping bank at the top of the photo, then pushed through the tall grasses and brush to get to some clear sand on the other side. From there, it had access to the forest and a creekbed. This bear was walking away when it snapped its photo. Notice the bare patch of fur on the left hind leg. 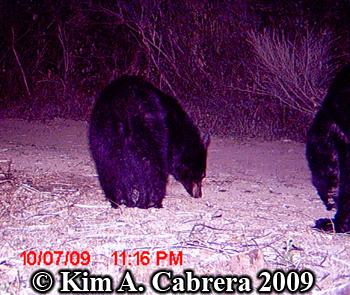 In the photos below, there is a similar bear, probably the same animal. A black bear in early summer, shedding its winter coat. The winter coat is heavy and can make a bear too hot in summer. Black bears prefer shady forest environments because it keeps them cool. 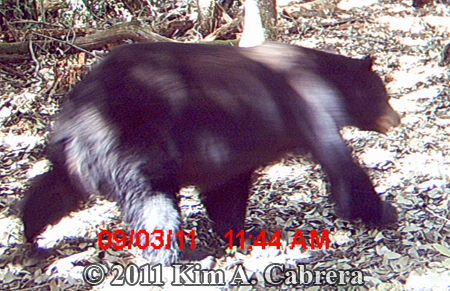 In direct sun, the black fur absorbs a lot of heat, so bears stay in the shade as much as possible. 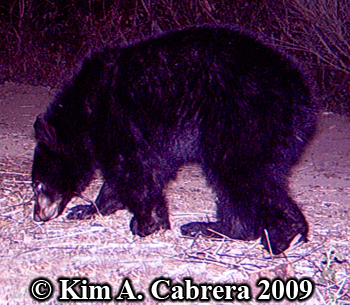 If the temperature is over 70 degrees, bears might be more active at night when it is cooler. This bear approached the camera. Bears are curious and intelligent. 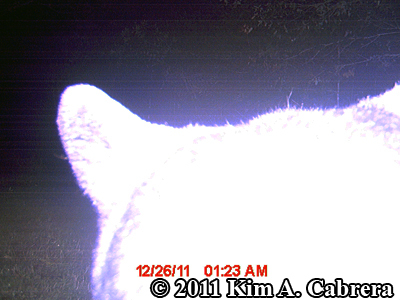 They check out new objects in their environment, such as trail cameras. One bear knocked one of my cameras off a tree! It wasn't being destructive, just curious! 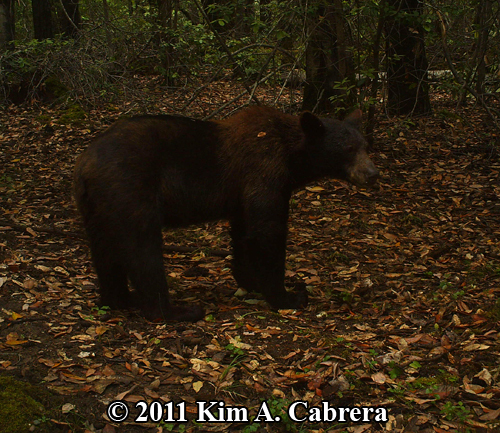 This bear may be the same one in the photo above, with the bare patch on the left hind leg. 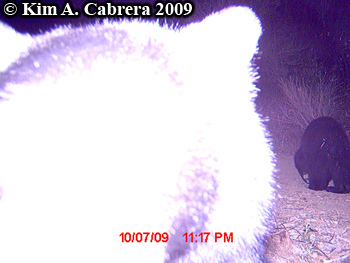 Another bear approaching the camera. This bear was moving fast and is a bit blurry! Bears can run over 30mph over short distances, but they are not built for running for long periods of time. 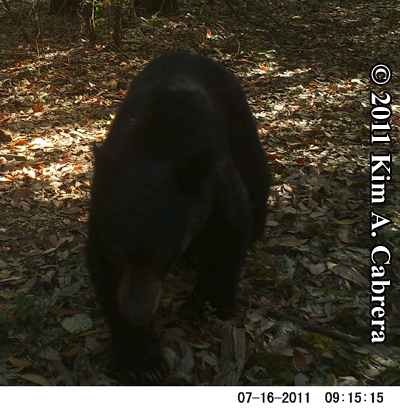 This black bear was curious about my trail camera and came over and sniffed it! 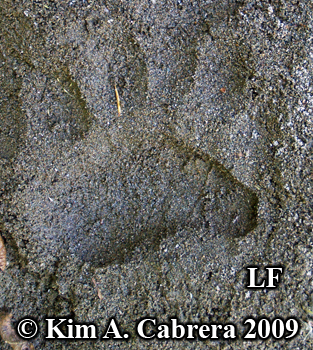 The right front foot of a black bear. This animal was found as a roadkill by the side of the highway. I figured its death should not be in vain, so I photographed the feet for use in educational purposes. 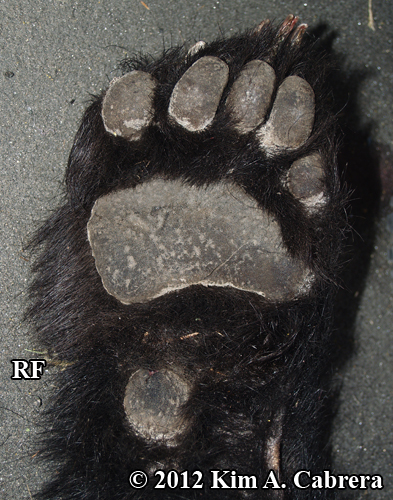 You can see the small round pad, called the carpal pad, that sits below the metacarpal pad on the bear's front foot. The carpal pad does not always leave a mark on the ground. 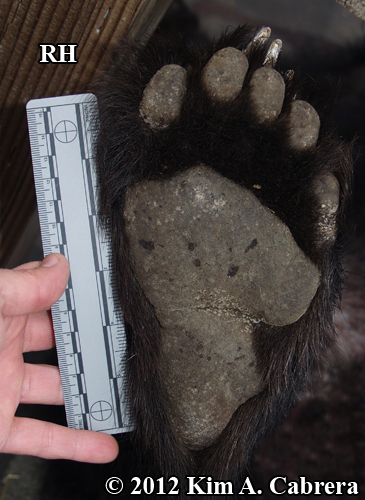 The right hind foot of a black bear. This animal was found as a roadkill by the side of the highway. I figured its death should not be in vain, so I photographed the feet for use in educational purposes. 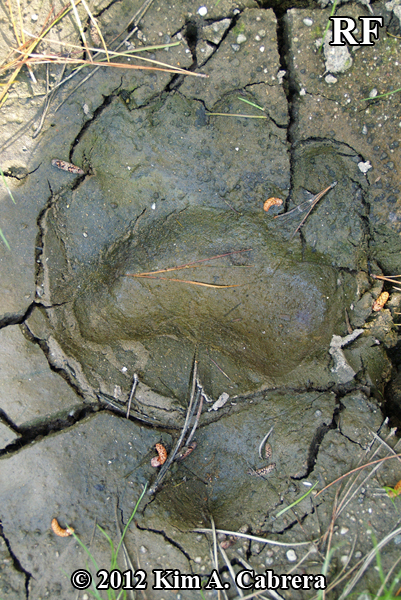 The hind foot shows a small triangular area inset with fur on the metatarsal pad. 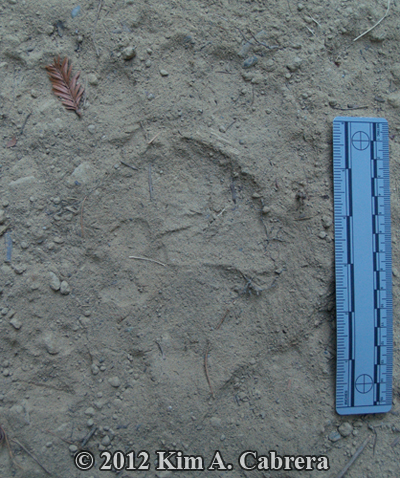 Here is the left hind footprint of a black bear. You can clearly see the line across the metatarsal pad in this track. 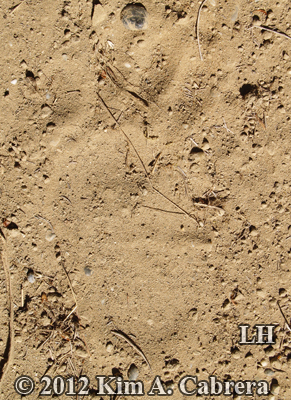 Another left hind black bear track, this one in fine sand. This track shows some weathering by the wind. 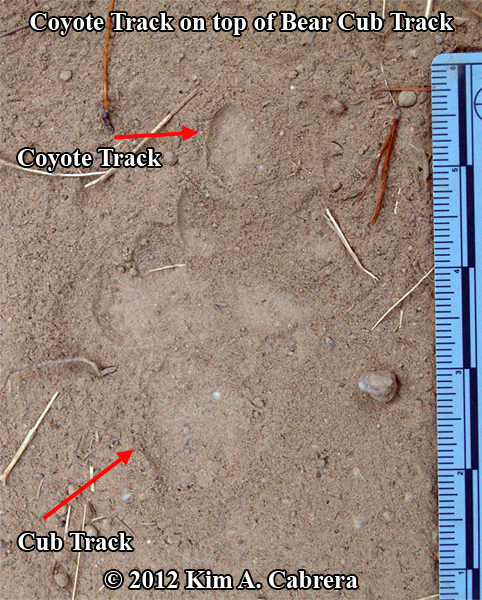 In this photo, you see a coyote track on top of the small track of a black bear cub. 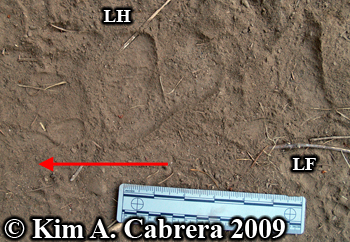 The cub's track is lower left and the coyote track overlaps it in the upper right. The cub's track is not much bigger than to coyote's! 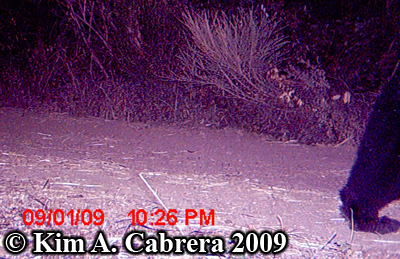 In fact, coyotes can be a threat to bear cubs. If mama bear is not close by, a coyote can catch one. 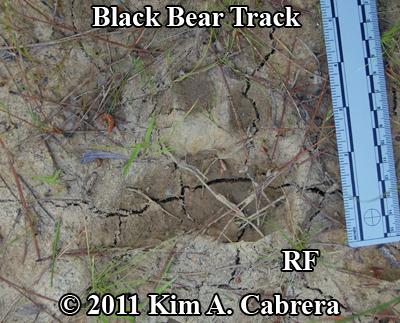 The left hind track of a black bear. 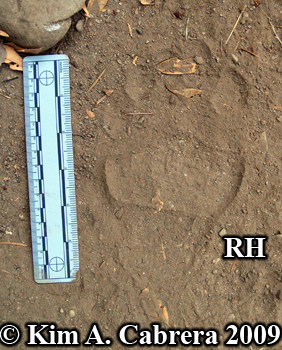 This track looks like it belongs to a young adult or an older yearling, due to size. 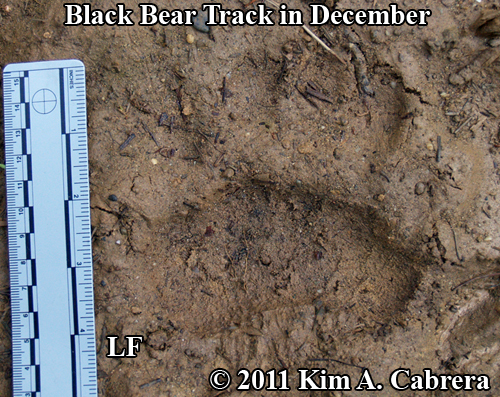 The very beautiful full track of a large male black bear. 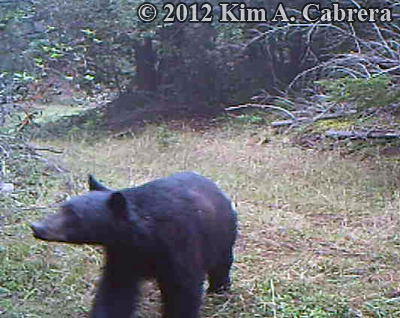 This bear visited one of my trail cameras, then walked in this nice sand. Perfect tracking conditions! The bear was here first. 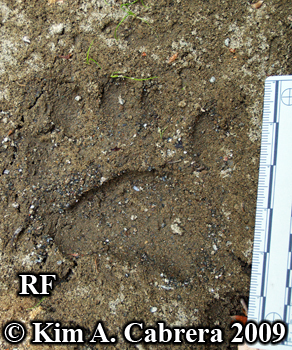 Then, the bobcat walked on top of the bear track! How many bobcat tracks can you see in this photo? How many are on top of the bear's track? Black bear trail in sand after a rain storm. 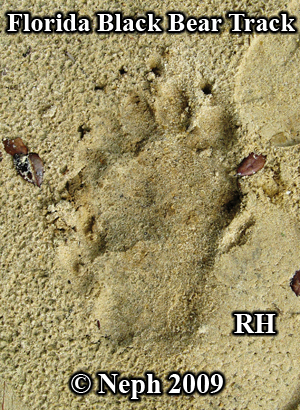 Find bears and bear tracks items in my new store. clocks, and much more. Custom bear products are available. Just send me an email with your request. 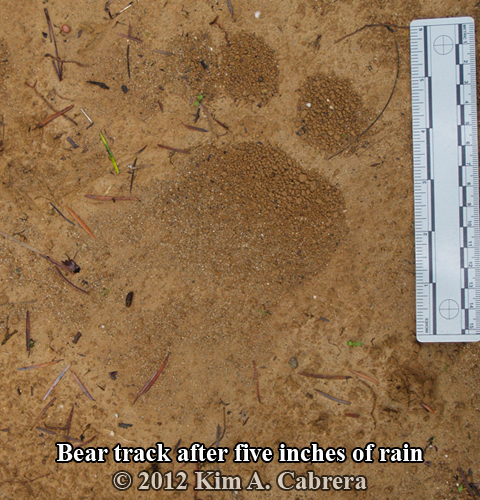 Visit Beartracker's Nature Store at: www.dirt-time.com Happy tracking! !